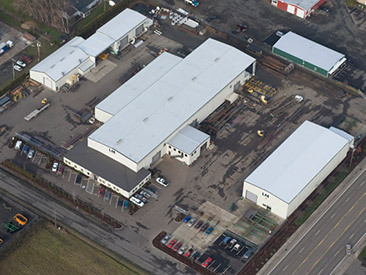 Our new fabrication plant and offices, constructed in 2004, are located on six acres near the junction of Hwy 99E and Hwy 34 in Tangent, Oregon. We are just minutes from I-5 and have access to a rail siding. We have over 55,000 square feet of efficiently- designed fabrication space serviced by a combination of 22 gantry and jib cranes with capacities of up to 10-tons each.